GAHS senior Ashton Webb (left) spikes the ball after a set from junior Peri Martin (7), during the Blue Angels’ straight games win over Portsmouth on Sept. 27 in Centenary, Ohio. A dynamic duo of a different kind. Gallia Academy volleyball senior Ashton Webb and junior Peri Martin landed on the Division II All-Ohio third team and honorable mention lists respectively, as selected by the Ohio High School Volleyball Coaches Association. Webb — an outside hitter and defensive specialist — was also on the All-Ohio third team as a junior, and is the first Blue Angel to earn multiple all-state volleyball honors. This season, Webb had a team-high 369 kills, giving her program record 1,086 for her a career. Webb’s 75 aces this season were second on the team and put her six-shy of 300 for her career. Webb is a verbal commit to Ohio University. 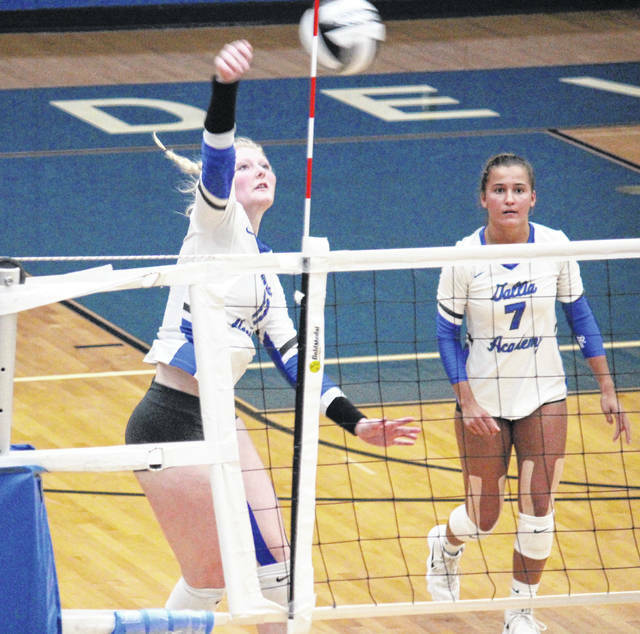 Martin — just the third Blue Angel to be named to an All-Ohio team — was Gallia Academy’s setter, dishing out 802 this fall to put her just 16 away from 1,500 for her career. This season, Martin had a team-best 95.8 serve percentage, while recording 41 aces. Martin is a verbal commit to West Virginia State University. GAHS was 21-4 on the season, winning its fourth straight sectional title and OVC championship. Alyssa Flading of Roger Bacon was the Division II Coach of the Year, with Sparta Highland’s Rob Terrill, Sheridan’s Mandy Fox, Bishop Hartley’s Michael Rahe, and Indian Valley’s Tera Pryor earning Coaching Achievement Awards. Keanna Avery, Claymont OH/DS Sr.
Peyton Bloomer, Oak Harbor MH/DS Sr.
Grace Maziar, Bishop Fenwick S Jr.
Chiamaka Nwokolo, Bishop Hartley MH/RS Sr.
Bridget Oder, Highland L Sr.
Erin Shomaker, Granville OH/MH Sr.
Skye Stokes, East Liverpool S/OH Jr.
Raina Terry, Highland OH/DS Jr.
Coach of the Year: Alyssa Flading, Roger Bacon. Rob Terrill, Sparta Highland; Mandy Fox, Sheridan; Michael Rahe, Bishop Hartley; Tera Pryor, Indian Valley. Ashley Browske, Lake Catholic OH Sr.
Emma Conrad, Sheridan S/OPP Sr.
Isabelle Crow, Tippecanoe S Sr.
Ava Francis, Jonathan Alder OH So. Kira Merkle, Bellbrook MH Sr.
Mac Podraza, Big Walnut S/OH Sr.
Kitanna Rakestraw, Indian Valley MH Sr.
Lexi Sauber, Wauseon MH/MB Sr.
Sarah Degeorge, Jefferson Area OH Sr.
Ines Grom, Wyoming S Jr.
Hannah Hall, Archbishop Alter DS/L Sr.
Corinne Parker, Jonathan Alder OPP Sr.
Cammy Smith, Ontario MH/MB Sr.
Ashton Webb, Gallia Academy OH/DS Sr.
Lydia Wiers, Willard MH/OH Sr.
Rachel Wildermuth, Tippecanoe MH/S So. Kirsten Bogunovich, Marlington S Sr.
Abby Bryll, Archbishop McNicholas L Sr.
Ellie Cox, Crestwood OH Sr.
Hunter Fry, Indian Hill MH Jr.
Julia Gardon, Bishop Fenwick MH Jr.
Kelly Hoffman, Crestwood S Jr.
Maya Kerr coste, Revere OH Sr.
Peri Martin, Gallia Academy S Jr.
JayLynn McClarren, Cambridge S Jr.
Amelia Moore, Lexington MH/S Sr.
Kortney Reynolds, Jonathan Alder MB Sr.
Jennifer Rush, Granville OH/DS Sr.
C J Sapp, Cardinal Mooney L Jr.
Payton Vogel, Bellevue MH Sr.
Abigail Walker, John Glenn MH So.